at the Went Tree Farm in Foster, RI on Saturday, October 6, 2018. The event is free and open to the public, and registration is not required. 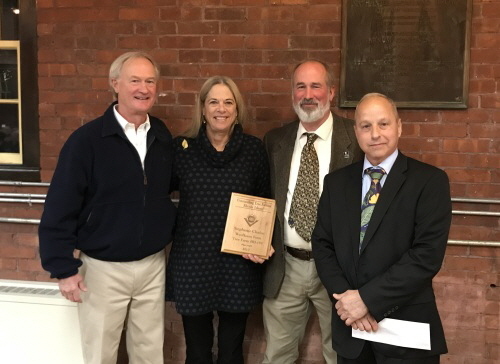 were presented the 2017 Outstanding Tree Farm of the Year Award. The Rhode Island Tree Farm Committee is pleased to announce the release of the Rhode Island Tree Farm Program Strategic Plan. The 5-year plan is designed to provide direction for the Rhode Island Tree Farm Committee to ensure that our resources are properly invested in our state and communities. As a member of the nation's oldest and largest network of woodland owners, we hope you will take a few minutes to review these documents. The mission of the Rhode Island Tree Farm Program is to promote the growing of renewable forest resources on private lands while protecting environmental benefits and increasing public understanding of all benefits of productive forestry. The American Tree Farm System® (ATFS) -- a program of the American Forest Foundation -- is committed to sustaining forests, watershed and healthy habitats through the power of private stewardship. Since 1941, ATFS has educated and recognized the commitment of private forest owners in the United States. Currently, ATFS has 33 million acres of privately owned forestland and 51,000 family forest owners who are committed to excellence in forest stewardship, in 46 states. Tree Farmers share a unique commitment to protect wildlife habitat and watersheds, to conserve soil and to provide recreation for their communities while producing wood for America. These individuals hold the key to the kinds of forests, forest activities and forest resources future generations of Americans will enjoy. ATFS has established standards and guidelines for property owners to meet to become a certified Tree Farm. Under these standards and guidelines, private forest owners must develop a management plan based on strict environmental standards and pass an inspection by an ATFS volunteer forester every five years. Water. Wildlife. Recreation. Wood. The four sides of the Tree Farm sign tell the story of sustainable forestry ... a thriving forestland that has clean water, a healthy wildlife habitat and recreational opportunities. Our green and white diamond shaped Tree Farm signs are widely recognized across the country. ATFS, dedicated to putting more good forestry on more acres.